To lose one councillor may be considered a misfortune, to lose two looks like carelessness to plagiarise a quote from that great character of Oscar Wilde – Lady Bracknell. We want to protect the Green Belt. We are concentrating our energies on providing the evidence we need to convince the Inspector the amount of housing which can be built is unlikely to meet the population needs, because it has to be appropriate for the district and supported by evidence. Last Monday I prepared the annual accounts for the Oxted Community Hall, it’s great to see community bookings still going well. I just wish Crossroads was able to find a community organisation to occupy their part of the building. They moved out nearly a year ago to combine their operations in West Surrey. I met Louise, our Chief Executive on Tuesday morning and we discussed our current financial position and our strategy to meet the challenges ahead. In addition we talked about the progress on the Caterham BID and the town centre improvement plans. I am very grateful Louise was able to meet me at 8am, so I have a fighting chance of getting into work before mid-morning! On Wednesday I met the Leader of Woking with our respective Chief Executives. As usual in my meetings with other district leaders we compared notes on the Local Plan. Woking is a similar size to Tandridge and has an Objectively Assessed Need (OAN) figure of 10,098 compared to our 9,400. The OAN is just a forecast of the number of people who might be living here in 20 years’ time. This needs assessment is something all councils are required to have by the government. But that forecast of need is absolutely not the same as the number of houses we are saying we will build. However I did find Woking’s asset strategy interesting, as they are building social and affordable houses to rent on their own sites. On Wednesday evening I was invited to Caterham Valley Parish Council to discuss current issues including the Local Plan, fly tipping, recycling, council house building and the well-being agenda. In addition, we talked about my particular concerns about youth depression, as we have had three local suicides and a murder in the last two years in Oxted alone. Thursday was the Limpsfield by-election. Sadly we lost our safest seat, only a week after losing Councillor Clive Manley, who has decided to leave the conservative group. To lose one councillor may be considered a misfortune, to lose two looks like carelessness to plagiarise a quote from that great character of Oscar Wilde – Lady Bracknell. What made it particularly hard was that we had an excellent local candidate in Neil O’Brien, who could have brought some fresh thinking and energy to the team. But we hope he will be able to represent us at another election. There is no doubt voters are rejecting us because, despite our track record of conserving the Green Belt and special character of our area, they believe we will build all over the Green Belt. This is absolutely not true. We want to protect the Green Belt. We are concentrating our energies on providing the evidence we need to convince the Inspector the amount of housing which can be built is unlikely to meet the population needs, because it has to be appropriate for the district and supported by evidence. I and the team will just have to continue to demonstrate that we will achieve a robust local plan, which gives us control over future development and protects the character, openness of our area and the Green Belt, which is what makes the Tandridge district so special. What we all need to consider is that we have to have some house building to meet the current and future needs of residents and their families. Otherwise the district will not be sustainable in the future. Not everyone who lives here now, was born here. We need new residents to replace those who move on to keep our economy vibrant. The Local Plan will help us in this by allowing us to control where and how much is built. 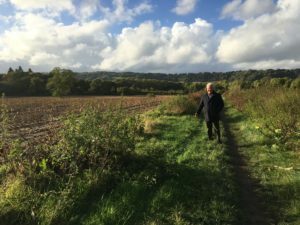 On Friday Jackie Wren and I, as ward councillors for Oxted North, received an advanced briefing on the current progress on the Local Plan and in particular how the Green Belt site assessments had collected detailed evidence within our ward. All the documents and supporting evidence will be released on Monday 24 October 2016.